Discover the tasty side of nature at the Valmiera Restaurant Week, from 6 – 12 November as a project from Riga-Gauja European Region of Gastronomy 2017. In its 2nd edition, during one week participants will have the opportunity to taste the rich gastronomic offering and wide range Latvian cuisine flavours. The Valmiera Restaurant Week is one of the events from the rich program implemented to celebrate 2017 European Region of Gastronomy and set to promote and preserve food diversity. The philosophy of the event comes from the inspirational concept, “Ar dabu šķīvī” (or wild at palate). The desire is to highlight and reveal the gastronomic varieties of the region in a creative and sensorial way. Gastronomy is conceived in strict connection to the tasty side of nature which is highlighted taking as starting point wild products the earth has to offer. Ancient rural and cooking tradition are nowadays still alive in the Latvian Cuisine. The idea behind the event is that what we eat has to come directly from the fields nearby our homes and restaurants and from the woods surrounding our towns. 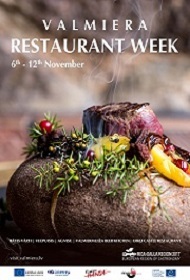 Valmiera’s Restaurants will make seasonal, genuine and local products the protagonists of this tasting week. These products will be valorized by innovative recipes and dishes delivered in a contemporary way and restaurants will privilege food lovers with exclusive offers for multi-course meals. Valmiera Restaurant Week will also take place within the framework of the project “Hanseatic Approach to New Sustainable Alliances” co-funded under the Central Baltic Programme 2014-2020, eleven partners from Latvia, Estonia, and Sweden develop joint projects in order to promote Hanseatic heritage. Photo from the archive of Dikļi Palace.